Watch with Hebrew dates and temporal hours. Top time display shows temporal hours, i.e. 1/12 of the time between sunrise and sunset or vice-versa. Tap to switch between "2h 20m" format, counting hours from 0 through 11, and time-like HHMM format, with 600 being fixed at sunrise and 1800 fixed at sunset. 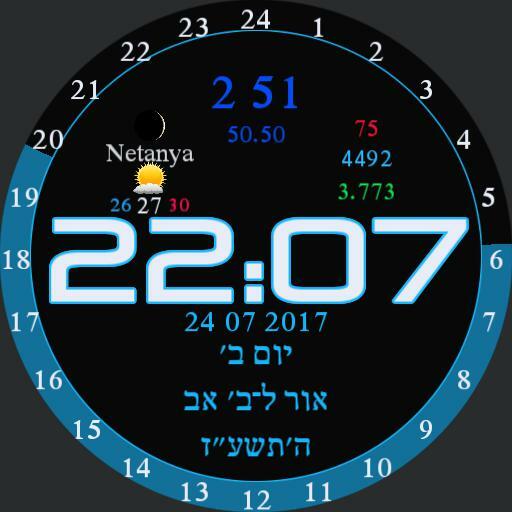 The current length of the "hour" is shown immediately underneath.Hebrew date shows below; tap it to toggle between English and Hebrew. The yellow arc around the outside shows daylight hours; a small 24h hand tracks time on it. Tap the main time display to get a list of todays Zmanim dont tap again to switch back; it switches automatically after a few seconds., along with a red arrow pointing toward Jerusalem.